Choosing the right school district can be a daunting task. Should you consider private school or public? Who can give you an honest perspective on a potential school? Simplify the process with this guide. Learn how to select, visit and evaluate a potential educational district. Imagine your child in an environment where he or she is stimulated, engaged and accepted. Are you picturing one-on-one instruction or a classroom full of enthusiastic peer? Is the school large and welcoming or small specialized? Keep these ideals in mind as you search for a new school. While no school will completely satisfy your vision, you shouldn’t be coerced into giving up the essential attributes that will allow your child to shine. Consider the institutions that are available within your area. Are the schools public, private, magnet or charter institutions? Are there support networks for homeschooling families or online students? Financial parameters should certainly be a concern. Find out whether local schools will financial aid for student families. You may want to examine the academic performance index for the institutions in your area. 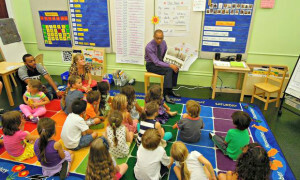 Professionals at Local Records Office, which provides information about local public and private schools, encourage parents to consider student-teacher ratio student grade population as they narrow their search. Spend time at each institution that you are considering. Interact with students, educators and administers. Simply get a feel for the building and the day-to-day atmosphere. Rather than viewing only your child’s grade, sneak a peek at some of the highest-grade levels. You may be able to observe in-session classes in order to get a more complete picture of the school’s educational system. Notice whether or not the teacher engages students and encourages questions. Are students working effectively on their own and in groups? Are they distracted or disinterested? Jot down notes about each institution that you research and visit. Take into consideration your gut reaction as well as acquired information about the student population and achievement levels. Make careful notes concerning application dates and financial aid deadlines. Check with each school about the enrollment process and required pieces of documentation. You may need to produce a birth certificate, proof of residence or vaccination records. Talk to parents in the districts that you are considering. You don’t need to go door-to-door in order to get honest opinions about an institution. Ask for assistance in contacting the school’s parent-teacher association officers or talk to school staff members who are parents themselves. Choosing a district and moving to anew home can be intimidating for children as well as parents. Ultimately, it is your child who will be spending the majority of their time at a particular school. While elementary school students may be too young to make an informed decision, middle-schoolers and high-schoolers may offer useful insights. What did your child like best about his or her old school? What are his or her fears and concerns? You can certainly use your critical insight and research to inform your decision. However, be careful not to let your own goals and requirements overshadow the needs and interests of your child.